Date and Time: Friday 11 November from 13:00 to 19:00, Saturday 12 November from 9:30 to 18:00 and Sunday 13 November from 9:00 to 15:00. Lunch and refreshments will be provided throughout the event. On Saturday there will be an after party in the CERGE-EI student club. You can stay overnight for free at CERGE-EI. The Datathon is for bachelor and master students interested in working with data and / or topics related to urban development. We do not expect you to have much experience of working with data but you should have a working knowledge of using Excel. During the Datathon you’ll get hands-on experience of what it‘s like to solve a real urban development challenge using data analysis skills. You’ll choose a topic that interests you, form a team with other students and spend two days solving the case. In the end you‘ll present your findings to the jury and members of the winning team will each receive a 1,000 USD scholarship for our MA in Applied Economics program and ARCHIP will also offer a 1,000 USD tuition discount for their masters program. 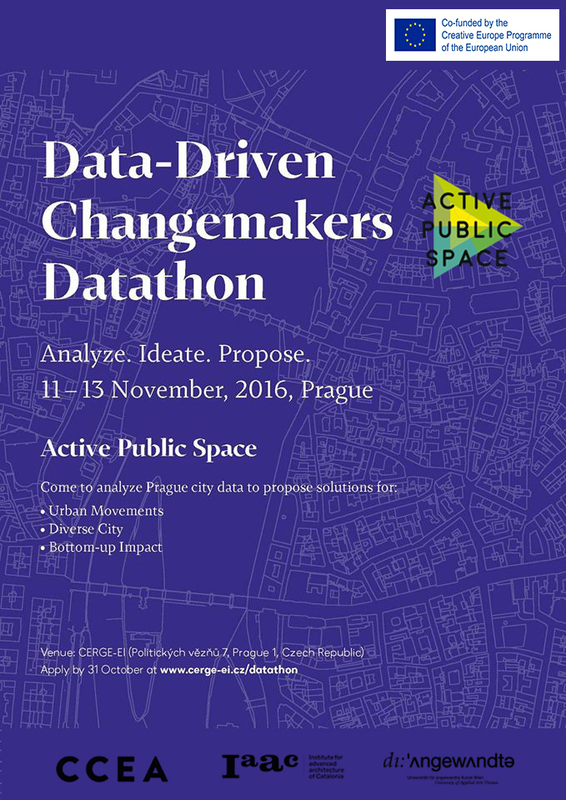 Datathon will be followed by a specific intervention scheme to improve a public space in Prague. The Datathon participants will develop a proposal for an intervention scheme, based on their analysis conducted during Datathon. This intervention will be installed and its impact tested within 2-3 months after the Datathon event in a specific location in Prague. It is anticipated the intervention should improve the quality of the city’s public space and inhabitants experience of living in and moving around the city. Moreover, it will present how data can be used to solve a problem in order to improve society. The Datathon participants who were involved in proposing the intervention, will be welcome to continue working on the intervention after the Datathon event to make it ready for installation. Stay tuned, more details coming soon!